Simple image filtering using OpenGL-ES on the GPU. This class first copies the given input image into an OpenGL texture, then applies OpenGL-ES vertex and fragment shaders to achieve some image processing, and finally gets the resulting pixels back into an image. CV_8UC1 greyscale image. This is uploaded to GPU as a luminance texture. In the shaders, R=G=B and alpha=1. CV-8UC4 color images. This is uploaded to GPU as an RGBA image. In the shaders, R,G,B,A are as in the input. CV_8UC2 RGB565 images. This is useful to avoid any conversion of color results. GPU results are directly rendered into an RGB565 color buffer, which may directly be the buffer of an RGB565 output RawImage, i.e., the pixel memory was allocated and "belongs to" the USB gadget driver. Thus, the rendered pixels can be directly read back from the GPU into the RawImage and send over USB with no additional copy or conversion. See DemoGPU for an example of this. CV-8UC4 RGBA images. This may be used either for higher-accuracy color output, but may require conversion since we do not support sending RGBA images over the USB link. 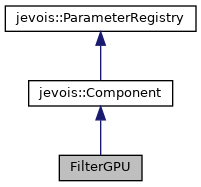 Using jevois::rawimage::unpackCvRGBAtoGrayRawImage() one may unpack such a packed RGBA image into 4 single-channel planes. This then makes it possible to run one RGBA shader that produces 4 different filtering effects in each of the 4 color/alpha channels, and to then unpack the results into a 4-up greyscale RawImage buffer for sending over USB. DemoCPUGPU uses this, uploading a greyscale input image and then running 4 different filters to create the R, G, B, and A outputs, finally unpacking those into 4 greyscale images sent over USB. input texture is in "tex"
current coordinates within texture are in "tcoord"
on host, mesa may be in the way of other drivers, eg nvidia. You need to get them out. FIXME: yet, this code still does not run on the host. Maybe OpenCV which is using highgui on the host which uses Qt which uses OpenGL (not the ES version) is the issue. Definition at line 80 of file FilterGPU.H. Definition at line 22 of file FilterGPU.C. References GL_CHECK, GL_CHECK_BOOL, LFATAL, and LINFO. Definition at line 63 of file FilterGPU.C. Process an image. The dst image should be allocated with correct image size and pixel type. Definition at line 125 of file FilterGPU.C. References GL_CHECK, LFATAL, and LINFO. Set an image processing program. Definition at line 81 of file FilterGPU.C. Set some program parameters, 1 float version. Definition at line 101 of file FilterGPU.C. Set some program parameters, 1 int version. Definition at line 117 of file FilterGPU.C. Set some program parameters, 2 float version. OpenGL is not very thread-friendly. Hence the program chosen using setProgram() will actually be instantiated inside the process() function so everything happens in one thread. Here, users can set program parameters, those are just memorized and will be set in process() as well. Each time setProgram() is called, all cached parameters are cleared and they should be set again. Definition at line 93 of file FilterGPU.C. Set some program parameters, 2 int version. Definition at line 109 of file FilterGPU.C.